Serpents are energies — those of the vital are usually evil forces and it is these that are usually seen by people. But favourable or divine forces are also imaged in that form, e.g., the kundalini Shakti is imaged in the form of a serpent. The serpent is the symbol of energy — especially of the Kundalini Shakti which is the divine Force coiled up in the lowest (physical) centre, Muladhara, and when it rises it goes through the spine and joins the higher consciousness above. Energies are of all kinds and the snakes can also symbolise the evil powers of the unregenerate vital nature. The serpent is a symbol of force, very often a hostile or evil force of the vital plane. Sometimes serpent indicate energies simply, not harmful ones; but more often it is the other way. 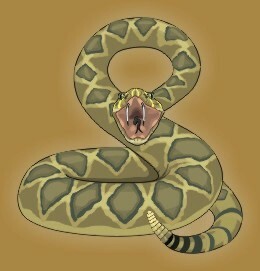 The serpent with the hood over the head generally indicates future siddhi. 1, The psychic change so that a complete devotion can be the main motive of the heart and the ruler of thought, life and action in constant union with the Mother and in her Presence. 2, The descent of the Peace, Power, Light, etc. of the Higher Consciousness through the head and heart into the whole being, occupying the very cells of the body. 3, The perception of the One and Divine infinitely everywhere, the Mother everywhere and living in that infinite consciousness.